Gardeners love chrysanthemums because they come in every shape and color, last for weeks, and boast many blooms per plant. 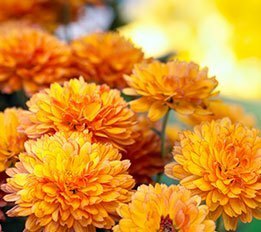 Interested in fall mums? The appropriately-named blizzard mums produce large, snow white blossoms. Carrie mums are rare, two-toned decorative flowers whose older petals don’t discolor. The lavender-rose Melissa mum blooms through late October. Early bloomers include the varieties, Bold Felicia and Zesty Jean. These Felicias are bold because of the hot pink hue of their petals, which frame yellow centers. If peach-coral is one of your favorite colors, seek out Zesty Jean mums. Of all of the varieties that share this color, Zesty Jeans have the most petals and retain their hue the longest. When planted in the fall, some varieties of mums behave like annuals, providing ample color before succumbing to cold winter weather. If you want your mums to return season after season, on the other hand, select the hardiest varieties or plant them in the spring. Unlike florist mums, many garden mums are capable of surviving the winter because they produce underground stolens. Put some effort into maintenance by mulching and pinching them, and garden mums will establish themselves before ice arrives. To encourage mums to overwinter, provide them with phosphorus-rich fertilizer. After the first hard frost, mulch them with straw or shredded hardwood, up to four inches at most. Dead blossoms can be pinched off, but wait until the spring to prune dead branches. At that time, you can also remove the mulch surrounding the mums so that new shoots have room to emerge. If you fear that some of your favorite mums won’t survive the winter outside, you can save them by overwintering them indoors. Pot them after the first frost, including as much of the root system as possible. Place them in a dark area, such as a basement or a closet, as long as its temperature remains in the 32°F to 50°F range. Water and keep an eye on your overwintered mums, checking in on them weekly to make sure that their roots remain damp. To reintroduce them outside in the spring, gradually expose mums to more light every day. Once the last killing frost has passed, they can return to your garden.